Congressional candidate Maria Cabildo talks with supporters. 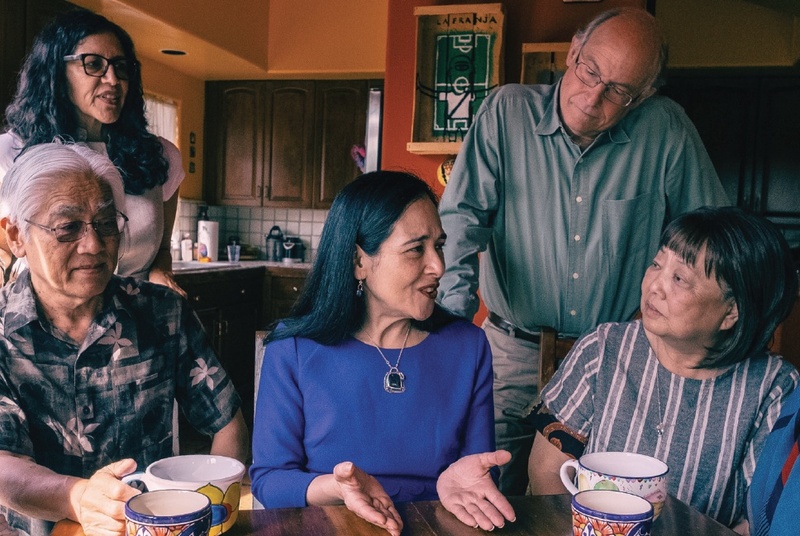 Maria Cabildo, one of the candidates in the 34th Congressional District election on April 4, is getting support from the Japanese American community. Cabildo, a Democrat, and 23 others are seeking the House seat vacated by former Rep. Xavier Becerra, who is now California’s attorney general. The district includes Boyle Heights, Downtown, Chinatown, Koreatown, Little Bangladesh and Little Tokyo. An urban and economic developer and housing advocate, is co-founder and past president of the East L.A. Community Corporation and served on the Los Angeles Planning Commission. “For 20 years we’ve worked with Maria Cabildo as she’s fought to create economic opportunity and affordable housing. That’s why we’re urging you to vote for Maria Cabildo for Congress in the special election on April 4. “What stands out about Maria are her core values and her compassion for serving those in need. She cares about people, and she understands the importance of family to us. Other endorsers include Jeff Chop, Yasue Clark, June Hibino, Kori Kanayama, Frank Lee, Kimi Maru, Kathy Masaoka, Mark Masaoka, Carrie Morita, Mike Murase, Rey Fukuda Salinas, Tak Suzuki, Yo Wakita and Steve Wong. The other candidates are Democrats Robert Lee Ahn, Vanessa Aramayo, Alejandra Campoverdi, Arturo Carmona, Wendy Carrillo, Ricardo De La Fuente, Adrienne Nicole Edwards, Yolie Flores (former Los Angeles Unified School District board member), Melissa “Sharkie” Garza, Assemblymember Jimmy Gomez (endorsed by Becerra), Sara Hernandez, Steven Mac, Sandra Mendoza, Raymond Meza, Armando Sotomayor, Richard Joseph Sullivan, Tracy Van Houten, Michelle “Hope” Walker (write-in) and Tenaya Wallace; Libertarian Angela McArdle; Green Party member Kenneth Mejia; Republican William “Rodriguez” Morrison; and Mark Edward Padilla (no party preference). According to The Los Angeles Times, the field could have been even bigger but Democrat Alex Poulton dropped out and Democrats Jason Ahn and Keith Kirkwood and Republican Karl Siganporia did not complete filing requirements. If, as expected, no candidate receives more than 50 percent of the vote, there will be a runoff between the top two finishers. 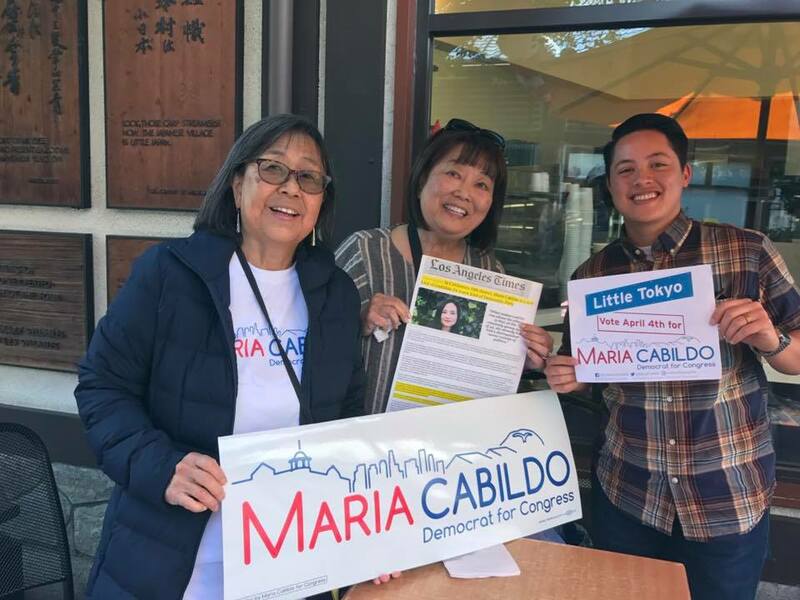 Kathy Masaoka, Carrie Morita and Rey Fukuda Salinas campaign for Maria Cabildo in Little Tokyo’s Japanese Village Plaza.